82/92 David Mumpower I don't know what an Egyptian God card is, but I feel an undeniable compulsion to buy one. Based on the inexplicably popular Kids WB television series (seriously, this show is vapid and awful), Yu-Gi-Oh! will be the first feature length animated movie based on this series that dates back to 2001 in the U.S. and 1998 in Japan. Ostensibly the replacement for the waning Pokémon, the folks at WB are surely wishing for a similar early franchise success. Both the television series and this film will be connected to the collectible card game that is the very basis for the plot. The original series has its source material in a manga by the same name, which translates to English as "master of games." For the uninitiated who have never had the opportunity to see the show, it's steeped in some "fictional" ancient Egyptian history where people played perilous shadow games with cards that could summon various monsters and magic that can be used as game pieces. These games eventually brought about a war that came close to destroying the whole world until the secrets of the game were locked away. 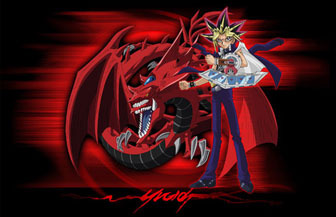 Now, millennia into the future, the deeply-voiced Yugi is a spiky-haired teenager who has unlocked these secrets, and as such becomes involved in all of the challenges involved with the primeval card game.